Patient presented with both gummy smile and alteration of tooth morphology. Please, keep in mind that patient completed orthodontic therapy, gingival plastic surgery, tooth whitening and occlusal equilibration before case finalization with porcelain veneers. It is my pleasure presenting the final result after cementing four porcelain laminate veneers on the upper incisor teeth. 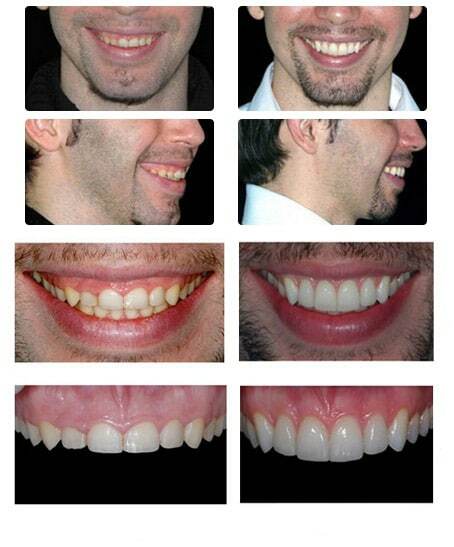 Please, note the huge improvement of both the dental and facial aesthetics by comparing the before and after pictures! A complete transformation of either tooth morphology, smile line or facial physiognomy can be easily appreciated.